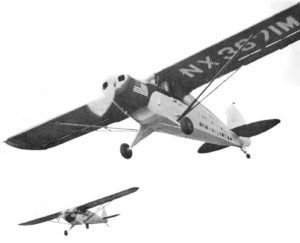 Two Piper PA-12 Super Cruisers made super around-the-world OUTSTANDING FLIGHTS in 1947. It all started in 1946 when two flight instructors at an airport near Washington, D. C. observed a newly certificated PA-12 taxi by and a comment made that with enough gas these aircraft were capable of flying around the world. Light aircraft–liaison aircraft–such as L-4 Piper’s, L-5 Stinson’s, and others played a vital role in the recently ended World War II. These slow, rugged, tube and fabric aircraft proved to be ideal platforms for infantry divisions in spotting artillery, medical evacuation, search and rescue, primary flight training and a variety of other important military operations. They proved their worth under the most demanding combat conditions throughout the war. Both George Truman and Cliff Evans were former military pilots and had observed the performance of these light aircraft. With a few modifications they believed the PA-12 was capable of an around-the-world-flight. So they proceeded to make plans. They didn’t have much money, but there were other ways to acquire the equipment and resources necessary for their venture. They gathered what was needed and embarked on an adventure to prove their prediction that Piper’s Super Cruiser was capable of circumnavigating the globe. An essential mod included installing long range fuel tanks necessary for crossing the vast Atlantic and Pacific oceans! The Day’s landed at 74 cities and towns in 20 countries during their world tour. An early light plane around-the-world-flight was successfully achieved by Charles Healy Day with his wife Gladys in 1931. They completed a 24,000 mile global tour in an open cockpit, side by side biplane he designed. 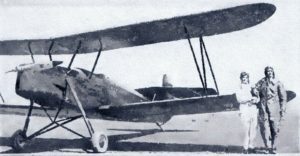 The 34 foot span airplane was powered with a 120 hp Martin D-333 engine. Their seven month tour included flights over 20 countries with visits to 74 cities and covered 16,000 miles flown over land and 8,000 miles with their aircraft loaded aboard ship for crossing the Atlantic and Pacific oceans. Charles and Gladys Day pose beside their airplane prior to embarking on their world tour. The Day Model A Special was planned originally for pilots with limited experience by offering them a safe, easy to fly aircraft. The only damage this aircraft suffered throughout the world tour was a bent tail skid mount caused by ground-looping across a ditch in Foo-Chow, China. Fuel capacity was only 24 gallons. An additional 24 gallon tank was installed for the world flight. This extended range for over land flights but 48 gallons was insufficient for flying over the oceans. Day was a highly respected aeronautic engineer. He designed the Standard J-1 in 1914 which was used to teach World War I cadets to fly. It was also a favorite of barnstormers during the 1920’s. He also designed the later five-place New Standard GD-24 and D-25. George Truman took off first in his aircraft named ’The City of Angels” departing Teterboro, N.J. August 9, 1947. Cliff Evans followed in his Super Cruiser named “The City of Washington.” They completed their 25,162 mile around-the-world-flight in 122 days and 23 hours, landing back at Teterboro airport December 10. Weather proved to be a serious problem throughout their flight. 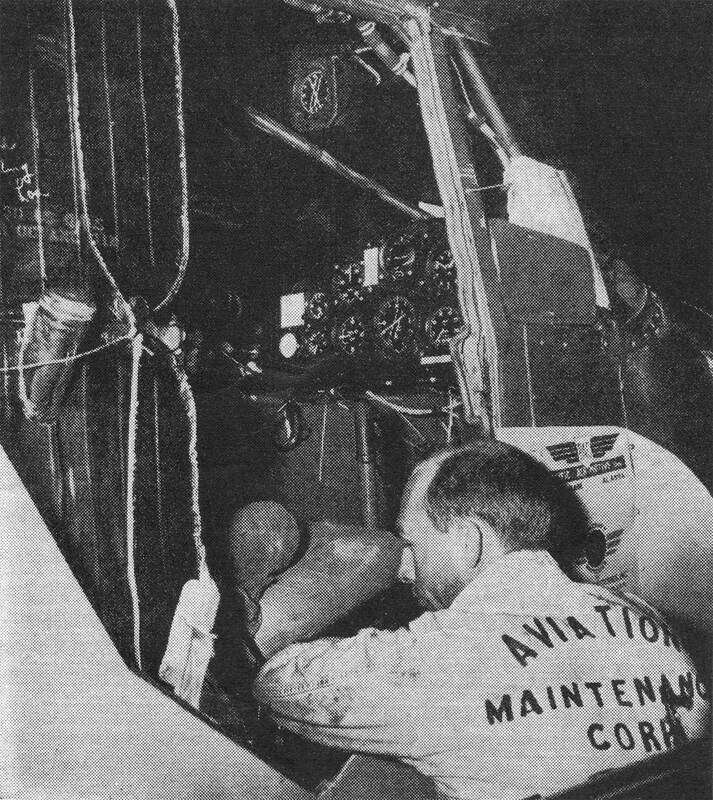 A damaged tail wheel proved to be the only mechanical problem they encountered. (Amazingly a tail skid problem, somewhat similar to that faced by the Day’s on their world flight.) Truman was first to land so is recognized as the first to circumnavigate the globe in a light plane. Truman’s aircraft was donated to the Piper Aviation Museum in 2006. Evans PA-12 was donated to the Smithsonian Institution in 1949. 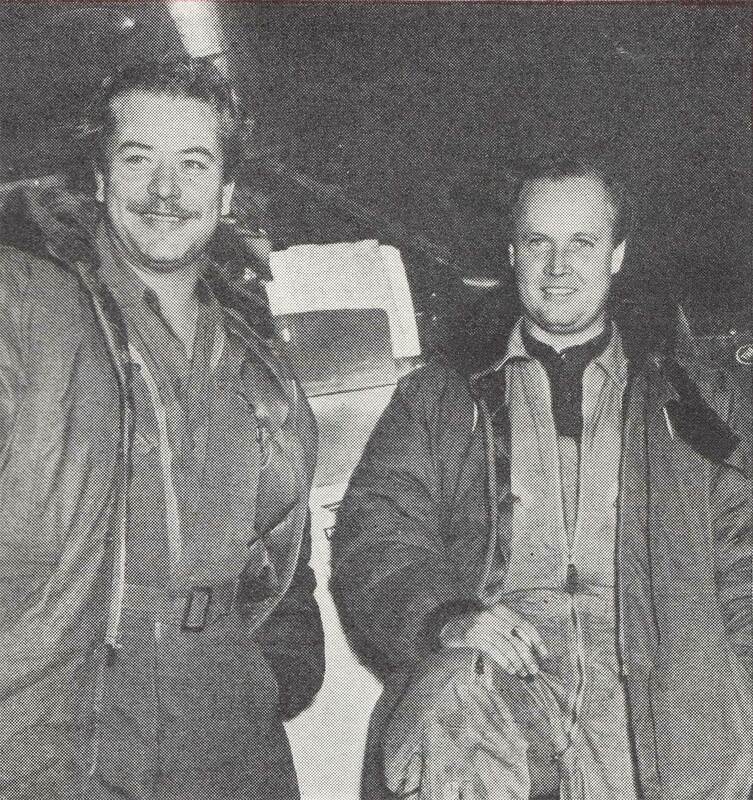 The following article covering this OUTSTANDING FLIGHT appeared in the February 1948 issue of FLYING. Piper Super Cruisers which traveled around the world bear NX numbers because special equipment gave them 500-lb. overload. Two able lightplane pilots circle the earth with the aid of special equipment, know-how – and a horseshoe. George Truman, Los Angeles, and Clifford V. Evans, Washington, D.C., have just completed the “impossible” – a 25,000-mile flight around the world in two overloaded Piper Super Cruisers. They did it on a shoestring, a horseshoe and a gasoline credit card. Their two small craft were not the same as other Super Cruisers “off the showroom floor,” though. They were both built around used airplanes given them free by the Piper Aircraft Corp., new Lycoming 0-235-C engines purchased for $1 apiece, extra navigation instruments “donated” at greatly reduced prices, borrowed radios, and two extra gasoline tanks to give them each 100 gallons more fuel than standard types. All the extra equipment made the planes 500 pounds above normal gross weight. 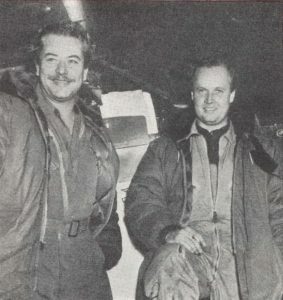 2) World flyers George Truman and Clifford Evans land at Los Angeles after covering 22,500 miles in four-month global flight. Dependability of the engines and the sturdy aircraft as they were buffeted by severe head winds, bad icing conditions, extreme heat, and rough runways was the most remarkable aspect of the trip. The worst mechanical failure was a partially damaged tail wheel. Yet the flight was with two planes, each of which had been in the air 244 actual hours when they headed east from Phoenix, Ariz., in early December for other eastern cities and then Teterboro, N.J. The flight proves more about dependability than speed. The two pilots left Teterboro August 9, and 114 days (or almost four full months) later were just pulling out of Phoenix to swing across the country, with many other stops scheduled: Weather and sickness were their main obstacles. It was the first time that any airplane – two in this instance – with only a 100-h.p. engine and of such small size has circumnavigated the globe, crossing both the Atlantic and Pacific Oceans. Wiley Post flew around the world in 1933 with the Winnie Mae but he had 575 h.p. Douglas “Wrong Way” Corrigan crossed the Atlantic in 1938 in a Curtiss Robin, powered by a 175-h.p. Wright Whirlwind. Despite 47 stops and take-offs with heavy loads before reaching Los Angeles. and bad headwinds much of the way, Truman and Evans averaged a little less than six gallons of fuel per hour over the entire trip. Oil consumption was low because the new engines were carefully broken in. The pair left the United States with little money. They had put most of their personal finances into preparations for the flight. Their gasoline credit card saved them spending cash, as did numerous official dinners and luncheons in their honor along the way. The Army Air Bases at which they stopped supplied them with meals at GI rates. At Los Angeles. friends picked up the tabs for a series of relaxing parties while an unexpected assist came on the last day of their stay when the Los Angeles Chamber of Commerce assumed a worrisome hotel bill. On the basis of what the flyers told a press conference, flying the world is expensive even in a Super Cruiser. But if Truman and Evans had had to pay for everything from start to finish they estimated it would have cost them $30,000. Now they hope once again to hear the jingle of cash through exploitation of their trip. The idea came to the pair last year. Truman, 39, is a native of Saskatchewan, Can., but came to this country in 1915 and later to Los Angeles, where he was a motorcycle hill climbing champion, diving expert and bowling team ace. He learned to fly in 1928, meanwhile running a restaurant in Glendale. During the war he was a civilian flight instructor at the Visalia Army Air Field, afterward serving a year in the Air Transport Command. Discharged, he settled in Washington, where he was an instructor at Brinckerhoff Flying Service, College Park, Md. He is married and the father of twin daughters. 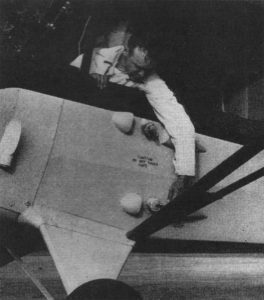 Loop antenna dial on world-circling plane is checked by mechanic. Note life raft pack, suspended above pilot’s seat. Evans, 27, also was a flight instructor at Brinckerhoff’s, where his casual remark that “you could fly a Piper Cub around the world” planted the germ for the odyssey. Evans was born in Washington, D.C. After two years at American University, he joined the Air Corps. He flew anti-submarine patrols from Greenland and logged more than 400 hours over-water flying. He later flew Skytrains in the CBI Theater, returning stateside as a captain to complete his services at the Pentagon. He then enrolled at Maryland University to study aeronautical engineering. He also is married and has two daughters. First, the two had to obtain the airplanes. Their appeal to the Piper Company resulted in the gift to them by William Piper, Jr., of two stock-model PA-12 Super Cruisers. Both were used but the steel and aluminum structure was in good repair. Empty weight of this type plane, with engine, is 950 pounds, with a normal load weight of 800 pounds, bringing the normal gross weight to 1,750 pounds. The two world-circling planes finally grossed about 2,200 pounds when ready for flight. They have a 35 ft. 5 in. wingspan and a length of 22½ feet. They cruise at 105 m.p.h. and have a top speed of 115 m.p.h. The flyers’ next job was to obtain engines. Officials of the Lycoming Division, Avco Manufacturing Corporation, were happy to cooperate. Knowing their “customers’” meager finances, Lycoming sold them the engines for $1 each. These engines are regular “off-the-shelf” Lycoming 0-235-C models. They are direct-drive, four cylinder, horizontally opposed, air-cooled, rated at 100 h. p. at 2,600 r.p.m. Then came the “deal” for propellers. Two new McCauley metal props were obtained for maximum efficiency in both take-off and cruising. They are thin, fixed, all-metal blades which require a minimum of servicing. Truman and Evans now had the planes, the engines and the propellers. Their next problem was instruments. They needed many more than are standard in stock model Super Cruisers. Their drift meters were home-made by Evans. Kollsman Division of the Square D Corporation came to the rescue and supplied the following for each plane: air temperature indicator, vertical speed indicator, tachometer, sensitive altimeter, air speed indicator, vertical dial direction indicator (compass), a clock, oil pressure gauge and oil temperature gauge. From the Sperry Gyroscope Corporation they each received a Sperry Gyrosyn Compass and a Sperry Gyro Horizon. Bendix Radio Corporation loaned them each 27 pounds of valuable radio equipment, including a Bendix Standard and VHF Transmitter for long range static free transmission and communication, and a Bendix Receiver with two bands for reception of standard commercial and airways broadcasts. Spot tuners permitted reception on 2870 and 6440 kc for interplane communication, while directional loop antennas enabled them to take position bearings and to “home” on radio stations. Electricity was supplied by Delco-Remy engine-driven generators and heavy duty Reading Rebat aircraft batteries. The Goodyear Company gave them two full sets of tires to replace the ones worn thin in practice landings. Two extra gas tanks, each holding 50 gallons, filled rear of both planes. Capacity of 138 gallons gave 2,400-mile range. Their next problem was range. Standard Super Cruisers have a fuel capacity of only 38 gallons in the wing tanks. They needed much more. This they solved by pulling out the rear dual seat and installing two tanks, each of 50 gallons capacity, in each plane, giving them enough fuel for a maximum range of 2,400 miles. These tanks were both filled at the top of the wings with emergency dump valves on the outside of the fuselage. There was much more to be done and special equipment to obtain. Air-sea safety and rescue apparatus was necessary. The Navy’s latest development, the Pararaft kits, were supplied each man. These consist of a one-man life raft, sunburn ointment, water de-salting set, emergency drinking water, three cans of rations, radar corner reflector, five dye markers, nylon line, solar still, A.P. day-nite distress signals, instruction manual, signaling mirrors and a sponge. 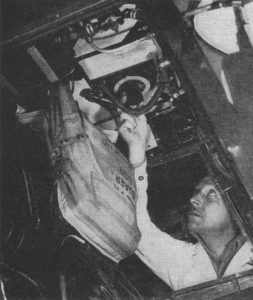 The two also took along seat-pack parachutes, nylon life vests, equipped with distress signals, dye markers and whistles, and wore Mark II exposure suits on over-water flights. In addition they had to find space for street clothing: a business suit, extra shoes, shirts and several changes of underclothes. Still to come were various essential tools in each plane, a spare set of spark plugs and a compressed-air tire inflation bottle. Dump valves for auxiliary fuel tanks could be opened by pilot during flight. They were necessary for landing emergencies. The Army and Navy required that they learn all about the safety and rescue equipment and pass rigid tests before they would be granted permission to take off. 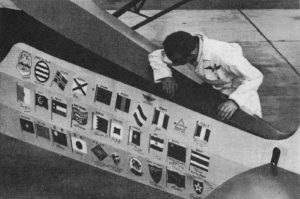 They also had to “bone up” on their navigation, lay out a flight plan, learn service facilities at each stop, study weather, become acquainted with their overloaded airplanes, and 101 other things. Their credit was established with the Esso Company and the credit cards came in at the last moment. After several hours on instruments, they landed at Presque Isle, Me., to check weather. Next day they flew to Goose Bay, Labrador, where they were delayed three days by bad weather. On August 13, the 750 miles to Bluie West One, Greenland, was covered in 8 hr. 35 min., despite constant headwinds. Both were taken ill with influenza, delaying their flight. On August 24 the trip was resumed. Their destination was Meeks Field, Reykjavik, Iceland. They were on instruments all the way. Here disaster came close. Fog shrouded the island and they flew past but luckily discovered their error in time to turn back. Evans said that just one hour after they landed the airport was socked in by fog and clouds. They headed for Prestwick, Scotland, on August 28, but landed at Newton Ards, Ireland, when they learned by radio that Prestwick was closed in. Two hours after refueling, they took off for Croydon Airport, London, where they were officially acclaimed. New York to London was 3,602 miles and required 42 flying hours. They took off on August 30, via Brussels, Belgium, for Ypenburg, Holland. Truman had planned this detour in order to visit a Dutch family to whom the Trumans had been sending food and clothing since the war. They were in Marseille two days later, but had to “sweat out” weather before they could take off for Ciampino Airfield, Rome, September 7. The air road to Farouk Field, Cairo, measured 1,350 miles, 1,000 miles of it over water. They completed the flight at an average speed of 112 m.p.h. They took off on their 808-mile trip to Bagdad, Iraq, on September 11, and then turned southeastward to Dhahran, Saudi Arabia. They were detained by Arabian authorities for six days, although they held visas and advance flight permits. Karachi, Pakistan, was the next stop and the 1,100-mile trip was covered in 9.5 hours September 19. They went to Jodhpur, India, the next day and were guests at the Maharajah’s palace. By September 24 they had landed at both Allahabad and Calcutta. They took off the next day and followed the coastline of the Bay of Bengal, crossed the jungles of Burma and finally reached Rangoon. They were now half-way around the world and had been gone seven weeks. Their 365-mile flight over the mountainous border between Burma and Siam was rugged and the small planes were severely buffeted by high winds and storms. They later touched at Bangkok and Hanoi, Indo-China, and on September 29 flew 558 miles to Hong Kong. Typhoons off the coast of South China held them up until October 5, when they left for Shanghai. On this trip they ran smack into 80 m.p.h. headwinds and were forced to make an emergency landing at Amoy, China. When they were hours overdue at Shanghai, a frantic search was about to begin for the “lost” airmen but was prevented when they were found safe at Amoy. In the face of a 40-m.p.h. headwind, they took off October 9 for their 500-mile trip to Shanghai. They left that city October 13 for Fukuoka, Kyushu Island, 540 miles distant, and on October 18 landed at Komaki Air Base, Nagoya. They flew to Haneda Airfield, Tokyo, on October 19, and were greeted by William Sebald, Chief of the American Diplomatic Section in Japan, and Lieut. Gen. Ennis C. Whitehead, commanding officer of the Far East Air Forces. The 525-mile trip to Chitose Army Air Field in northern Japan was flown on October 24, and on October 27 they went to Nemuro Field, Hokkaido Island, where they were to face one of their toughest hops – to Shemya Island in the Aleutian chain. 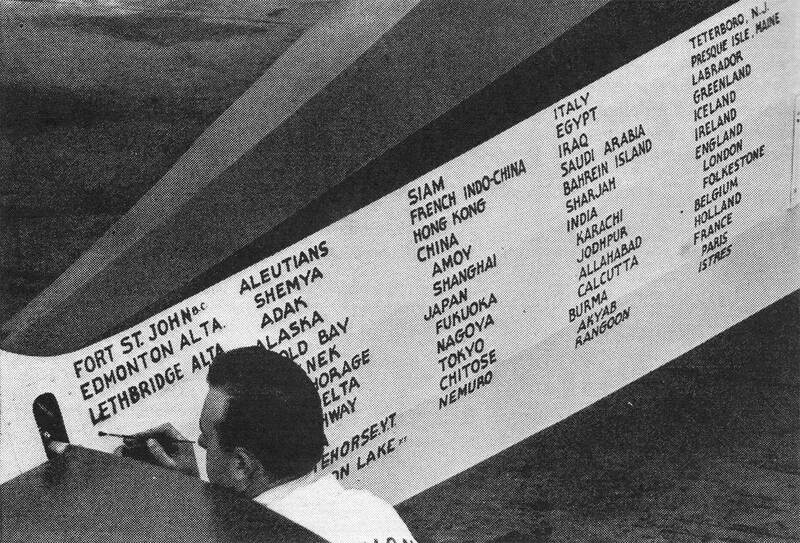 Stop-by-stop itinerary was painted on fuselage of the planes. Painter at bottom begins to letter the name “Los Angeles,” first landing after returning to the States. This flight was started early on October 28 and was made in 13 hr. 35 min. flying time. Their planes carried full loads of 138 gallons of fuel each for the first time on the trip. The runway was rough. Take-off was at night. The weather was foul. The two small planes lifted off okay but the pilots went on instruments immediately. Ice conditions were extremely bad. To help them in this crossing a “mothering” Flying Fortress and officers of the Third Emergency Rescue Squadron flew protection and assisted in navigation across the north Pacific. The sight of Shemya was “the prettiest thing we saw” on the long journey. A few moments later their wheels touched American soil for the first time in nearly three months. They left Shemya October 31, still accompanied by the Fortress and a Navy Catalina from Adak, landing at Adak after covering the 400 miles in 3.5 hours. On November 2, they flew 4 hr., 25 min. to Fort Randall at Cold Bay on the Alaskan mainland. Snow, wind and general bad weather in Alaska began working against them in earnest. On November 3 they flew to Naknek and the next day started for Anchorage but were forced back when the weather suddenly worsened. They reached Anchorage the next day, then were delayed until November 11 in their flight to Big Delta. They attempted to fly to Whitehorse, Y.T., November 12, but were forced by a snow storm to land at the Army base at Northway. For the next few days, when weather permitted, they managed hops to Fort St. John, B.C., Watson Lake, Y.T., Edmonton, Alta., and finally Lethbridge, Alta. From Lethbridge, Cliff and George took off on November 26 on a 1,200-mile nonstop flight to Los Angeles, where they landed at Metropolitan Airport at 9 p.m. Thanksgiving Day eve. Eight more stops and 2,500 miles later they were home in Teterboro.